Through a gentle, non invasive and relaxing Reflexology sequence on the feet or hands focussing on the lymphatic system, lymphoedema and excess fluid may be dramatically reduced in the whole body. 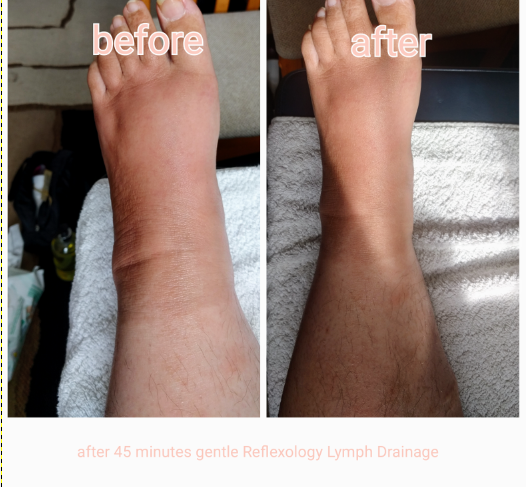 Just as in Lymph Drainage Massage RLD may help ease the symptoms of other conditions too such as ME, Fibromyalgia, cellulite, sluggish and poor digestion, stress, exhaustion, breathing disorders and sore breasts. Here are some photos taken January 2017 of one of my clients, a lady in her 30s. 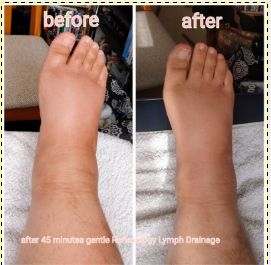 This is the immediate result of one 45 minute gentle, relaxing and non- invasive Reflexology Lymph Drainage. After RLD on R foot: Client has dislocated ankle and fractured heel bone. Swelling considerably reduced. How many treatments needed is often a very individual matter and it depends on why you are coming for treatment and on your body’s response. It really is best to talk this over with me personally. It is, however, usually beneficial for all to come initially for at least 6 weekly sessions. Some people may need to come more frequently and others less.